When you make an appointment with a top dentist, you can feel comfortable knowing that you’ll be in good hands during your appointment. Here at Park 56 Dental, our team works hard to make sure every patient knows what to expect and feels totally confident in their care. We want to make sure you feel comfortable from the moment you walk in, which is why our lobby features soft colors and lighting as well as comfortable seats that create a soothing and inviting atmosphere. Every member of our staff is ready to meet you with a smile, making it easier for you to calm any dental fears you may have and feel good about your care. Our dental treatment areas feature state-of-the-art technology, letting our top dentist provide only the best care for every patient. If you are interested in taking a closer look at the Park 56 Dental office, you can contact our top dentist in NYC today! Give us a call at (646) 783-3529 for more information about our office or to schedule an appointment. Dental implants are artificial tooth roots that typically feature crowns on top. The implant itself is typically made of metal while the crown is a traditional dental crown that resembles a natural tooth. If you lose any of your adult teeth, it is a good idea to replace them in order to prevent a variety of dental health and overall health issues that can occur. People who have lost one or more of their permanent teeth might make good candidates for dental implants. While dentures have long been thought of as the go-to option for patients who are missing teeth, dental implants have become more popular in recent years because they provide more security and strength. Talk to your dentist about dental implants if you are missing any teeth and are generally in good health. Caring for dental implants is very similar to caring for your natural teeth. After you receive this treatment from your top dentist, you’ll need to brush all of your teeth twice a day and floss in between all of your teeth at least once a day. You should also keep seeing your dentist for regular checkups. If you commit to taking proper care of your artificial teeth as well as your overall oral health, your dental implants can last a lifetime! Keeping up with regular dental appointments will help you make sure your implants are in great shape. Park 56 Dental makes it easy for patients to find out if dental implants in NYC are right for them. Give us a call at (646) 783-3529 to learn more about this treatment or other treatments available from our top dentists, including root canals, teeth cleaning, and veneers. Bad dental experiences can make it difficult to feel comfortable during your appointments. That’s why it’s important to find a dentist that helps you feel comfortable and relaxed both while learning about treatments and having treatments performed. You can ask family and friends for recommendations or research top dentists in your area to find options that will work well for you. One of most common reasons why patients experience dental anxiety is their fear of feeling pain during dental treatments. Luckily, sedation dentistry makes it easy for patients to get the care they need without remembering any pain or discomfort afterward. There are different levels of sedation available that can be utilized while patients receive a variety of treatments, including dental fillings and root canals. 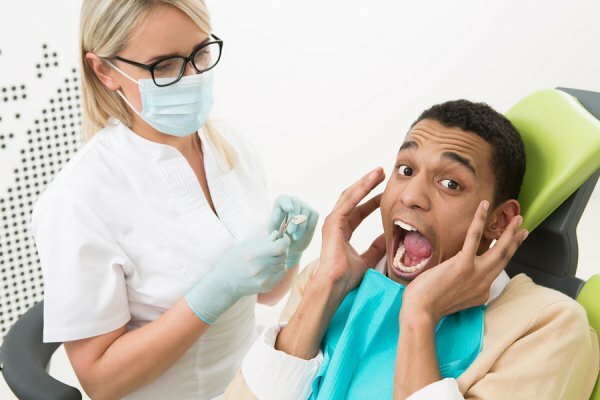 Even with sedation dentistry, you might find yourself feeling anxious before arriving at the dentist’s office. Practicing relaxation techniques can help you calm your nerves before and during your appointment. Try to control your breathing and consider asking a friend or family member to drive you to the dentist’s office. You should be able to talk to your dentist about your worries and find out if you’ll be able to enjoy any distractions during your appointment. If your dentist says it’s okay, you can bring headphones and listen to your favorite music or podcast while you receive treatment. Your dentist may also allow you to watch TV or a movie during this time. You can learn more about sedation dentistry in NYC by contacting Park 56 Dental today. Our top dentists offer a variety of services and can help patients feel more comfortable during their appointments. Give us a call at (646) 783-3529. Having a straight smile can give you more confidence. It can also help you maintain better oral health and overall health. If your teeth aren’t as straight as you’d like them to be, talk to your dentist about the benefits of Invisalign. When you watch this video, you’ll find tips that can help you during your Invisalign treatment. You’ll receive a series of clear aligners and wear each pair for about 2 weeks at a time. You should wear your aligners for 20 to 22 hours a day for optimal results. It’s also important to remove them before eating or drinking anything other than water. Are you ready to start straightening your smile with Invisalign in NYC? If so, contact Park 56 Dental today! Our top dentists are happy to answer your questions and help you decide if Invisalign is right for you. Call us at (646) 783-3529.